There are dozens of baby/kid skirt patterns out there and I’m 100% positive that this is one of them. But I’ve made and sold dozens of skirts, so I’ve learned a thing or two about the process. Read on after the jump. First you will need to cut fabrics to the right size rectangles. It will take some experimenting, but this guide should help you. Waistband: Measure the waist of your pretty little girl. Then add about 4 inches. That’s the length. 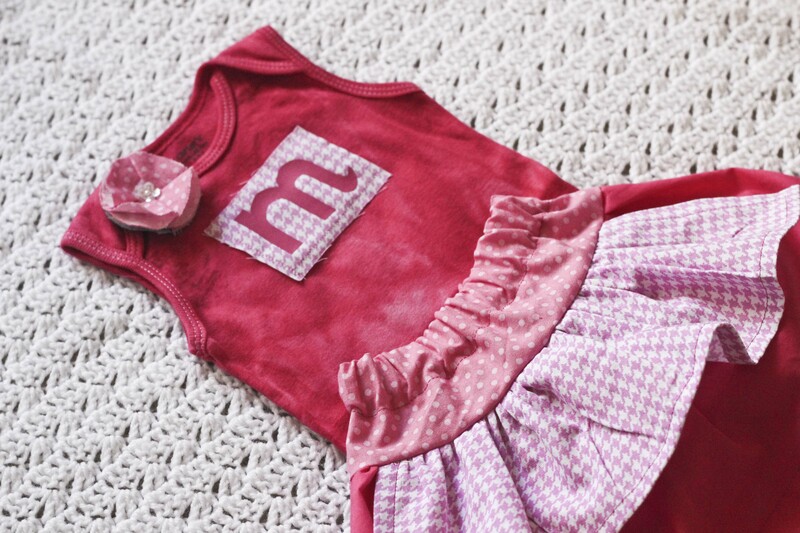 The height should be about between 4-8″, depending on how big your little girl is. Ruffle skirt: Double the measurement of the waist (before you add 4 inches) for the length. For the height, measure from the hip bone to the knee. Then add about 2 inches. Apron: Half the measurement of the Ruffle skirt length for this length and subtract 2-3″ from the hip-knee measurement (without the added 2 in). **Disclaimer: if you don’t have fabric that long, you can divide it in half and cut two pieces (plus an inch for the seam) and sew them together. This is the general measurement guide I use every time I made skirts. 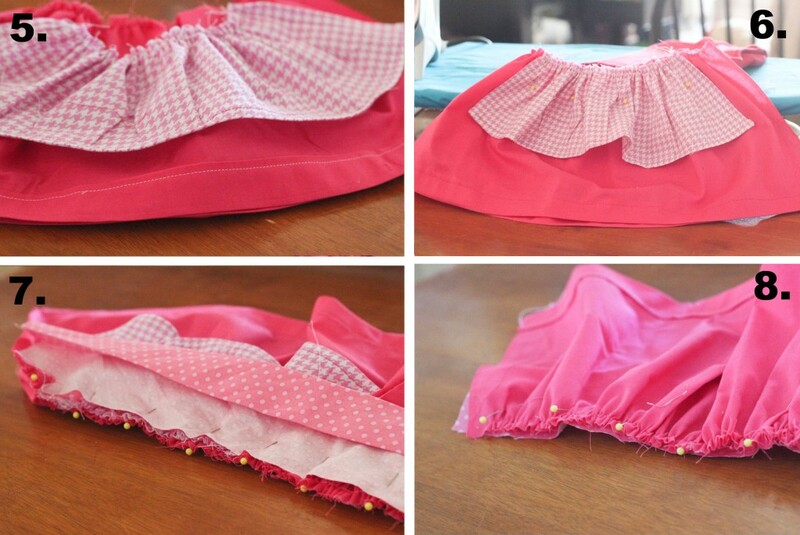 I’m going to refer back to this post for all my future elastic waist/ruffle skirt tutorials. Step 1. 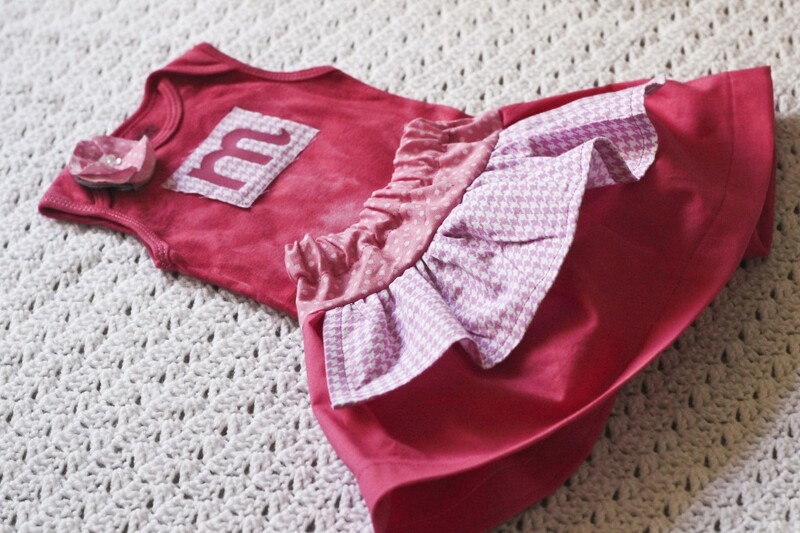 After you’ve cut your rectangles, sew the ruffle into the top edge of the Skirt and Apron pieces. To ruffle a piece of fabric, turn the tension on your machine all the way up and lengthen your stitch the longest it will go. Before you start sewing, pull the threads out so they will have a long tail. 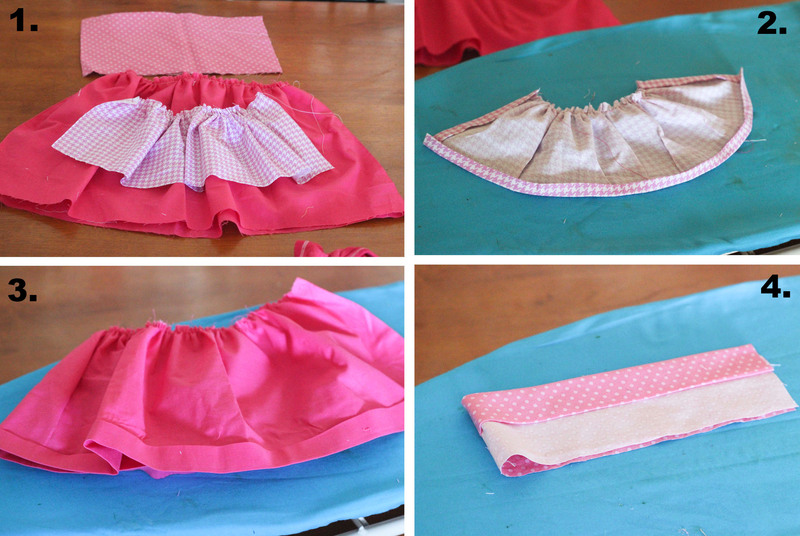 Match the top of the Skirt ruffle to the length of the waistband piece. Taking the bobbin threads, pull to adjust the ruffle so it is the exact length of the waistband piece. You can adjust the ruffle of the apron piece to be how big you want. Step 2. I always like to iron everything at the same time. That way I don’t have to keep getting up and down. Iron your hems on the apron piece. Double fold (fold up once, iron, fold up again, and iron.) Iron three sides of the apron. You will sew these hems right away so don’t unfold them. Step 3. Iron a hem on only the bottom of the skirt. Fold up 1/2″, iron, then another inch up and iron again. Then unfold it. Step 4. Take the waistband piece and iron down a 1/2″. Then fold down again about 1″ and iron. You have ironed the elastic waist casing. Unfold it. Step 6. 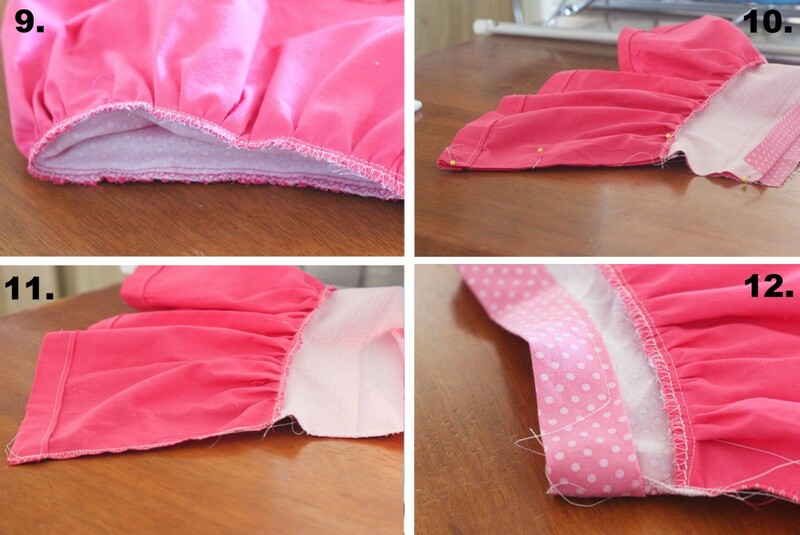 Fold the skirt piece in half, wrong sides together (line up the sides.) Then center your apron on the front and pin in place, lining up the ruffles. Sew the apron to the skirt. Step 8. Make sure that when you pin these pieces together the pins on on the ruffle side because you will need to sew with the ruffle facing up, making sure it is even. When you sew the new seam, make sure it is encasing the ruffle seams. Step 10. Fold the right sides of the skirt together and line everything up, especially where the ruffle meets the waistband. Make sure all your ironed lines are unfolded. Pin in place. Step 12. 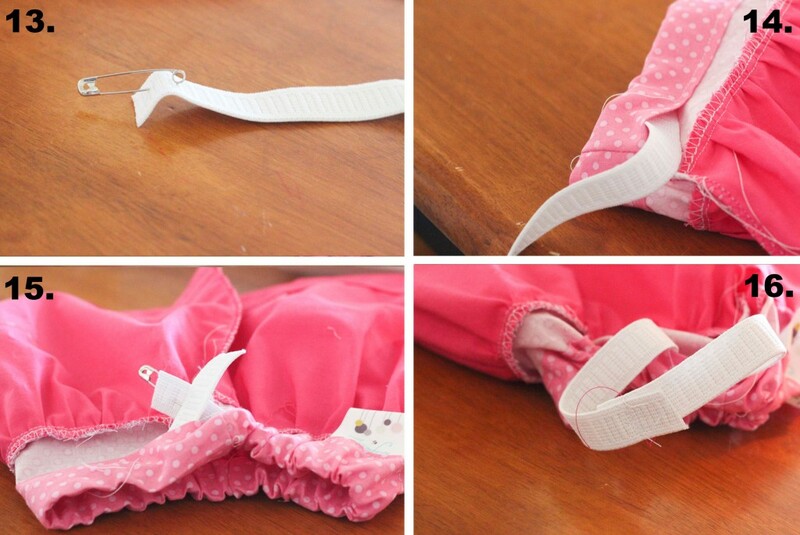 Fold the elastic casing back over where you ironed and then sew a 1/4″ from the lower edge. Leave about 2 inches open so you can put the elastic in. Step 13. To weave in the elastic, put a large safety pin at one end. Step 14. Sneak the safety pin in through the hole you left and push it through the casing to the other end. Make sure the other side doesn’t go through the hole though! Step 15. Line the two ends of the elastic up and make sure they lie flat (not twisted). Cut the end of the elastic a few inches shorter than the length of the waist, so that it gathers and stretches. Step 16. Overlap your ends and sew them down securely. Then sew the hole shut. Step 17. There’s no picture, but now you can fold up your skirt hem and sew it closed as well. To make the onesie, I dyed it with RIT dye, cut out an M out of heat transfer, ironed it on the contrasting fabric, then sewed it on. Easy Peasy. So cute! Love it! Great idea, thanx for sharing! This is SO adorable! 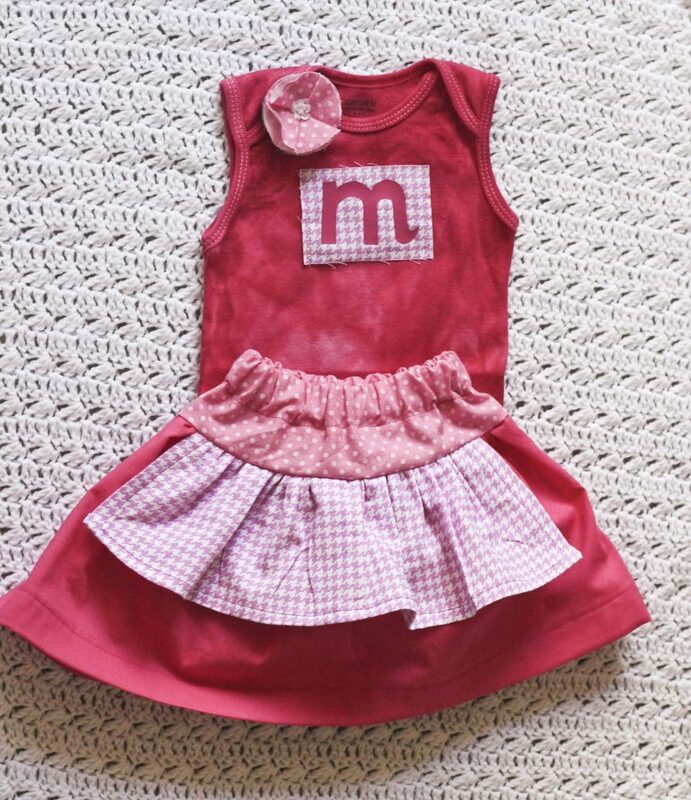 My cousin just had a little baby girl and I need to make this ASAP! Thanks for sharing!